Every instructor has their own “how I landed at Soul” story. Our new class of grads is no exception. They have stories of coming to Soul after careers as athletes. On a journey to sobriety. Having used training wheels through age eight. Here, some of our new grads share their stories with you, plus more on their passions, music obsessions, and class vibes. Get to know these incredible humans here, and then, book a bike and ride with them! Oh, and do be sure to say hi: They can’t wait to meet you. Caitlin (Northern California): Before SoulCycle, I was an NFL Cheerleader for the Oakland Raiders. I found SoulCycle while looking for some cross-training, and I instantly fell in love with it. SoulCycle combines music, athleticism, and dance—the perfect path for me after my cheerleading career. Patrick (Southern California): When I lived in Vegas, SoulCycle didn’t have a studio there, so I never got to ride unless I was visiting a city that had SoulCycle. I literally would base my vacations around SoulCycle locations. When I decided I wanted to move and start a new life, I went full-force into making my dreams come true. And here I am now, moving to Los Angeles as an instructor. 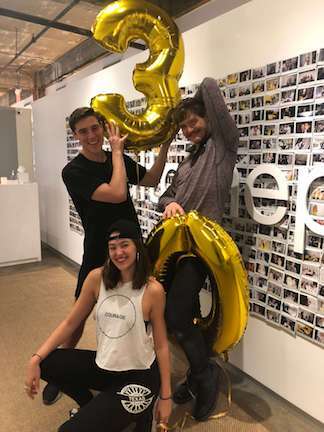 Tia (Toronto): It is ironic that I am at SoulCycle now, because I hated indoor cycling before SoulCycle, and as a little girl, I had training wheels on my bike until I was eight-years-old. Anyways, I found SoulCycle when I moved to NYC, as I was looking for a new way to train. After four years of dedication, discipline, and perseverance—and four auditions—I am now an instructor! Jack Bauer (Austin): Prior to SoulCycle, I was in the theatre scene in Chicago, as well as a full-time personal trainer. I had lost about 120 pounds—and was looking for a way to mix-up my routine when I found SoulCycle. My passion for music, people, and physical activity kept me coming back. Sheldon (Atlanta): When I started riding, I was using drugs and alcohol daily to deal with the fact that I hated myself. SoulCycle became a sanctuary for me on my journey to self-love and sobriety. Five years after the day of my first ride, I was offered entry into the instructor training program. Haley (NYC): I was a collegiate athlete until I blew out both of my ankles, which took me out of athletics completely. Through recovery, I found SoulCycle, and once I was cleared to clip in, I knew I found my purpose. I ended up auditioning four times to become an instructor. I knew where I belonged and would not stop until I got it! If you could have any musical artist (dead or alive) perform during your class, who would it be? Gunnar S. (Southern California): If I could have any musical artist perform live during my class, I would pick Céline Dion. I would just melt right into my saddle. Alex Levy (Boston): Zedd. Everyone already goes wild when you play “Clarity” in class. Can you imagine a whole 45 minutes with the genius himself? Unreal fun. Ellee (Palm Beach): Dirty Heads. The band is a mix of reggae and hip-hop with an unexpected beat drop. Very cool. Chelsea S. (Toronto): Justin Timberlake, because it's Justin Timberlake. Rebecca (Las Vegas): Lana Del Rey, because Lana is my Queen...and Ariana Grande, because God is a woman. Isabela (NYC): OutKast—that class would turn into an ATL love fest! Tori R. (Boston): Hands-down, Beyoncé. She is the greatest living performer. And she loves SoulCycle, so it could totally happen, right? What’s one thing you’re super passionate about, in or out of the studio? Sasha (DC): I’m passionate about helping you be the fullest, most unapologetically YOU version of yourself. Let yourself flourish! Anthony Jr. (Houston): I’m passionate about politics. Specifically, protest movements. I wrote my undergrad thesis about it. In my class, I encourage connection between riders and also connection to the realities of the outside world. Julia V. (Austin): I’m passionate about being honest with your feelings—and finding confidence and acceptance in whatever way it manifests. Oh, and I can sing, so you know I'll be taking advantage of having a pop star mic in class. Phillip (Miami): I’m passionate about empowering others to love themselves and to always create space for growth. My class guides you to a place of power and confidence. How would you describe your class vibe? Christopher (DC): My class is a diverse musical journey that helps you push past your limits, be wild, and get a little messy. Brian F. (Northern California): A wild flow of vibes—from high and light to low and heavy. Shai'La (Las Vegas): My class vibe is love! Michael (NYC): A journey of strength and unknown possibilities. Jarreau (Las Vegas): Ever wonder what would happen if Stevie Wonder covered a Rihanna song over a Timbaland beat with Blue Ivy as the producer? That's my class! Danny R. (NYC): Energetic. Generous. Every single person is welcome.